Today, much of retail planning is based on sales history and the resulting profile tables that are derived from sales history. Shouldn't planning decisions be based on "demand values" (sales + lost sales) and not on sales values alone. Depending on the category, Churchill has found that lost sales can account for 10%--20% of demand. While some of lost sales is unavoidable (paks, theft, etc. 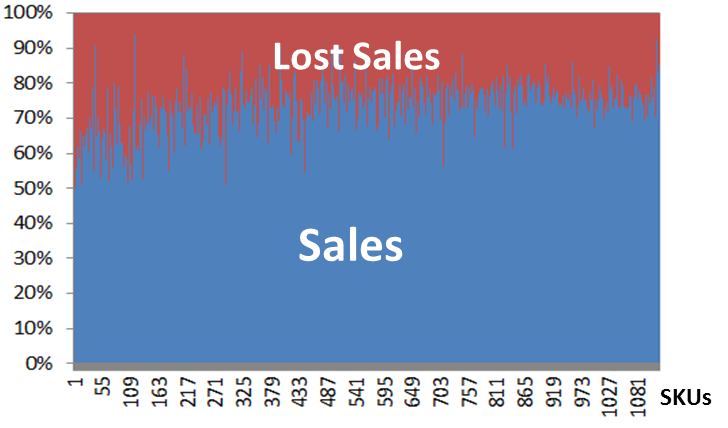 ), our analytics have shown that approximately half of lost sales is avoidable. Stated another way, the same inventory (or Open-To-Buy) investment can support an additional 10% of full margin sales if inventory is properly managed. Wouldn't it be better to improve assortment, allocation and replenishment plans rather than to incur unnecessary clearance markdowns. Churchill's Sales Could-Sell/Lost-Sales Analytics is a quick analysis that will improve your customer service and financial performance. Let's discuss the possibilities.